This page tells you how to start a new game. At present it covers only single-player games against AI opponents on your own computer. Start-up instructions for multi-player games depend on the the server and "clan" with which you're playing and are not yet covered - hopefully instructions for the major clans will be added later. You're continuing an adjourned game. You're starting or continuing a multi-player game. If you opted to run MOO II via DOSBox (see Installation) make sure you start the right DOSBox configuration file. MOO II automatically saves every 4 turns, and when you close the game down. "Continue" loads the automatically saved game. 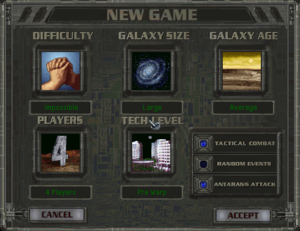 Starts a new single-player game by displaying the New Game Menu. Displays the 10 highest scores. Difficulty level - "Tutorial" is easiest, "Impossible" is hardest. On the harder levels the other empires are stronger and more likely to be hostile. Galaxy size. Small galaxies lead to very early contact and probably combat and / or attempts to steal technologies from you. Galaxy age. The manual says "old" galaxies have more planets that allow farming but fewer rich or ultra-rich planets; while "young" galaxies are the opposite. But in practice there seems to be little difference. Number of players. The greater the number, the sooner you make contact. "Pre-warp", where you have just 1 colony and no ships, and you have to research everything, including the basic interstellar travel techs. Average, where you start with a small fleet and a few technologies. Note that if your race is not Creative the game gives you a random selection of technologies and they might not be what you would want. On the other hand a Creative race gets all the technologies in the levels that have been "researched". Advanced, where you start with a slightly larger fleet and a few more technologies. Being Creative is an even greater advantage in Advanced starts. Tactical or strategic combat. Always choose tactical combat, otherwise you can't design your own ships and can only use those generated by the game software, which are usually pretty poor. If you don't want hands-on control of combat, just click the "Auto" button at the beginning of each battle. Whether random events are allowed. Most of these are bad news, unless you play with a race that has the "Lucky" attribute. Where the Antarans are allowed to attack colonies. If they are not, you can't conquer them, which is the highest-scoring type of victory. A ship in transit finds a wrecked ship and gets one or two technologies from it. Teleports one of a ship in transit to the closest of its empires' colonies. Too bad if that's in the wrong direction. Doubles a colony's population growth of for a while. A wealthy person donates money to an empire's treasury, usually a substantial amount. Decreases a colony's population by a lot each turn until cured; the more scientists you have working at this colony, the faster a cure is found. Tilts the axis of a planet to a more favorable or a worse climate, usually to either Terran or Barren. Increases or decreases a planet's mineral rating, usually by 2 levels up or down. Pirates raid all freighters in a system, preventing the import and export of food and population. The cure is to station some warships there until the pirates are defeated. A planet can gain / lose a "special feature"(Gold / Gem Deposit, Ancient Artifacts, Natives). Space Monster (Space Hydra, Dragon, Amoebae, Crystal) will attack a colony, bombard it, and then go away. A Space Eel, a fairly strong monster, will blockade a colony while it tries to spawn, thus preventing the system from importing or exporting food and population. After about 50-100 turns, the Eel spawns another Eel which goes to the nearest system that is not blockaded by and Eel, blockades it and tries to spawn. This cycle can continue until your whole empire is blockaded. Eels never attack colonies, so you will need to attack them with warships to destroy them. A Space Monster (usually a Dragon, which is probably the most dangerous monster) demands money. If you give it what it asks, it will attack ANY other colony at your command (make sure you tell it to attack an enemy) and then disappear. Space Monsters travel very slowly between a stars, but have unlimited range. A computer virus infects your systems, which sets your research back a few turns. Your scientists suddenly have a flash of inspiration and finish researching whatever you are researching, and gives you all other technologies in that category (e.g. a hydroponics farm and biospheres), regardless of how close you are. The more closer you are to finishing a research project, the more likely a random breakthrough becomes. No ship can go anywhere until this has dissipated, except that Trans- Dimensional racesare unaffected. "Freezes" a colony so that nothing can be done at this colony until the flux dissipated. Furtunately the colony doesn't need food while frozen by the flux. Antaran attacks on a frozen colony have no effect. A space monster will randomly "eat" a ship passing through hyperspace until it isn't hungry any more. One of your diplomats tries to assassinate one of another empire's diplomats or even its ruler, and your relationship with that empire deteriorates. A member of your political élite marries a member of another empire's élite, which improves the relationship between the 2 empires (don't think too much about the physical aspects). Scientists discover that a system's star will become a supernova in a few turns. Supernova. To prevent the extinction of all life in the system, assign all available colonists in that system to research. A comet enters the system and will destroy a colony in that system in a few turns. To prevent this, station a powerful fleet in the system until it destroys the comet. The next screen is the Race Selection Menu, which invites you select one of the pre-defined races or design your own. If you select a pre-defined race, no enemy empire will be of the same race. If you select "Custom Race", you will see the "Select Race Picture" Screen. You have to choose one of the pre-defined race pictures, and you will not meet another empire of that race in the game. Then you get one of the most important screens in the game, the Race Design Menu. See Race design for more details. These 2 screens are easy - you can just click "accept" unless you want the Hall of Fame screen to contain a unique ruler name for each entry. The Ruler Name and Home System Name screens have a small bug - the maximum length of the name varies from one game to another and sometimes is as short as 6 characters. Then you see the game's Main Screen, which is described in Game controls. When the game starts, your workers are producing nothing and your scientists are researching nothing. If you just click "Next Turn" immediately the game asks you what you want to research and what you want each colony to build - but you've wasted a turn, and that could cause you difficulties, especially in a small or crowded galaxy where you're likely to make contact with opponents very early in the game. This page was last edited on 24 December 2017, at 04:30.